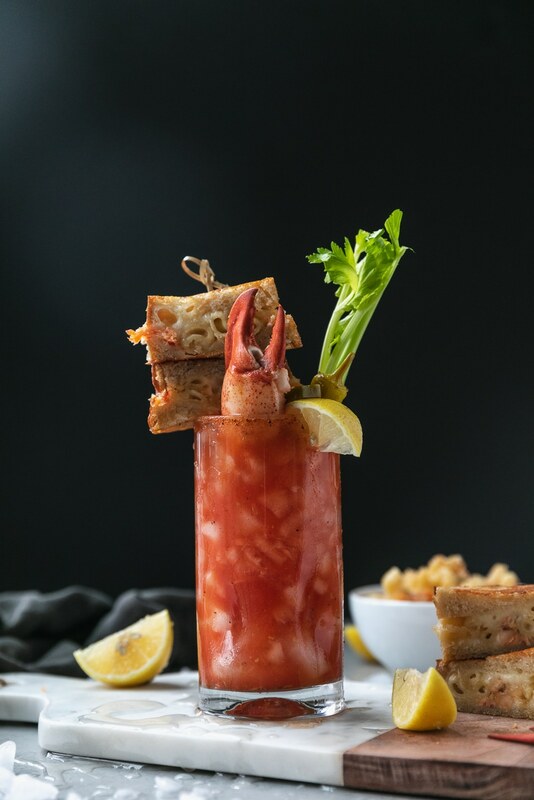 These Old Bay Bloody Marys with Lobster Mac and Cheese Grilled Cheese are such a fun cocktail to serve on game day or for your next brunch! 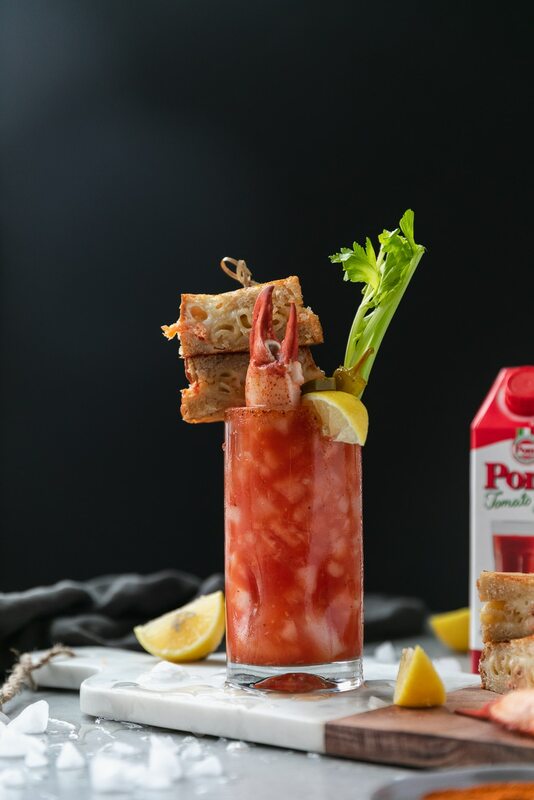 The Bloody Marys are pretty classic, but with a little Old Bay twist! They’re garnished with the most decadent grilled cheeses (there’s lobster mac and cheese inside of them! ), celery, lemon, and pickled veggies. 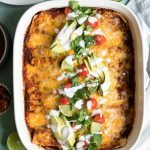 So perfect to serve at a party! These bloodys are definitely the most fun thing I’ve made in a long time. Maybe ever! 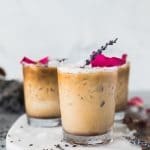 I’ve made some fun cocktails, boozy drinks, and bloody marys in my day, but nothing like these! They’re outrageous in the best way, and I can’t think of a better way to spend game day or brunch with friends! 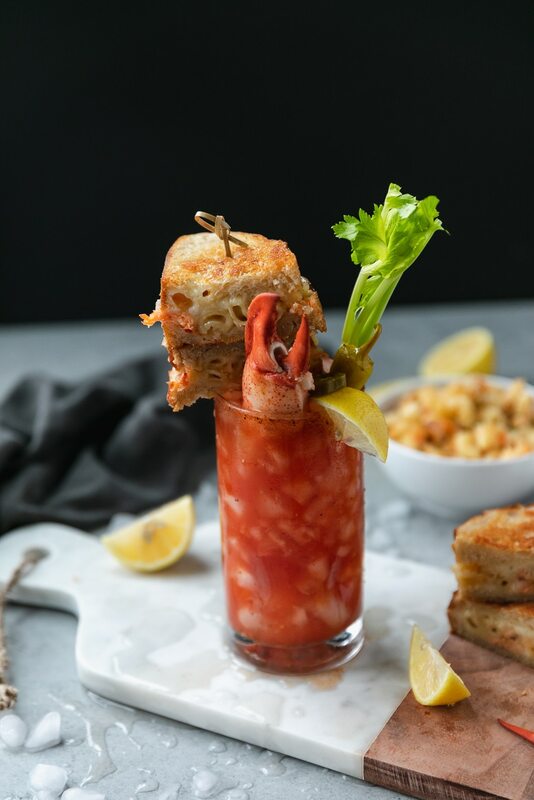 When I say that I stuffed the dreamiest lobster mac and cheese into a grilled cheese sandwich, and garnished a bloody mary with it, I’m not even kidding. In the slightest! These are so. much. fun. Those crazy bloody marys you see on restaurant and bar menus these days inspired this creation and I couldn’t be more excited about it! 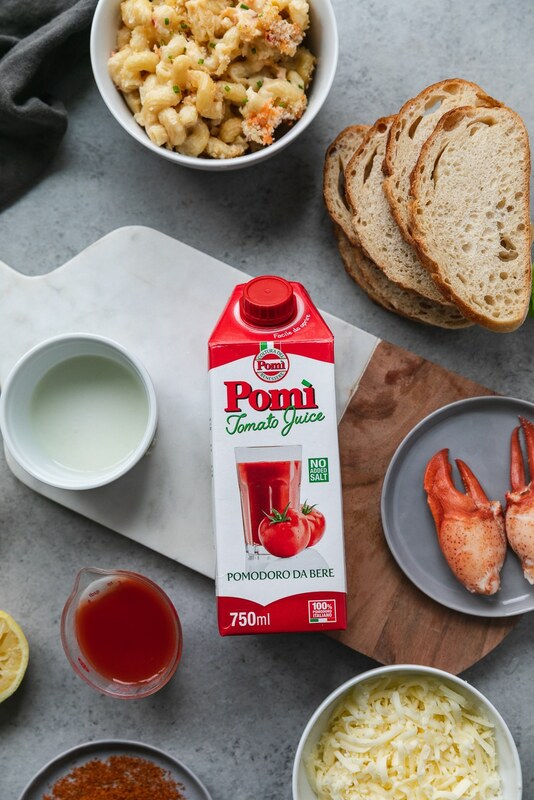 When Pomi asked me to create a “mini meal” inspired bloody mary recipe, I was ALL IN. 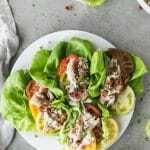 I had so many ideas, from little slider garnishes to shrimp skewers to meatballs, I had such a hard time deciding! But lobster mac grilled cheeses won! Can you even deal with this lobster mac? I’m not kidding when I say that this lobster mac is the best I’ve ever had, and although it might seem like a lot of work to make the mac and cheese to then stuff into grilled cheeses, to then garnish your cocktail with, I have to say that it’s definitely worth it. 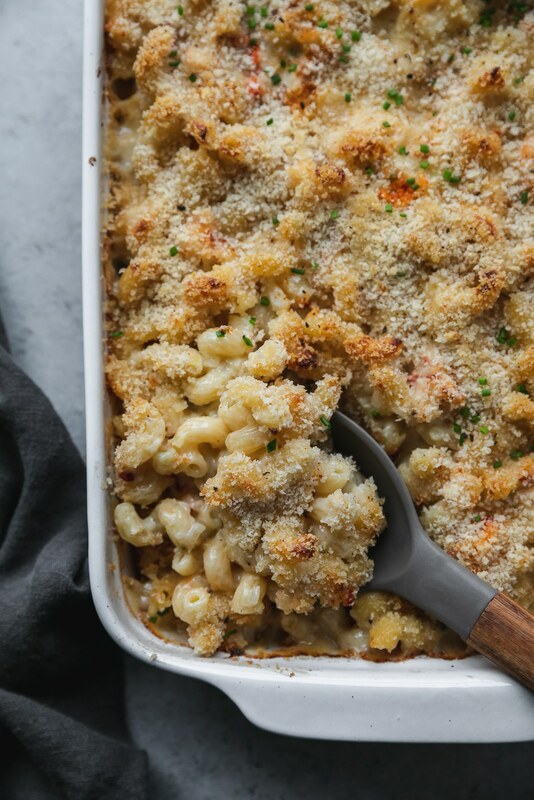 And you can still just eat the lobster mac on it’s own as a side or meal at your party too! 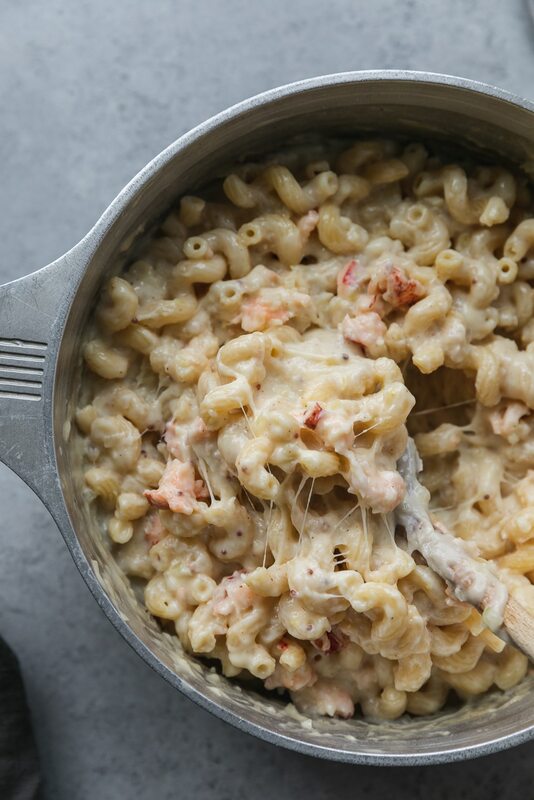 Because there can never ever be enough lobster mac. Right? This one has a little dry sherry in it, and to me, that takes any seafood dish to the next level. I also add it to this lobster dip and it’s insanely delicious. 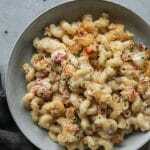 All of that being said, you can definitely do a boxed mac and stir in some lobster if you’re on more of a time crunch. But if you have time to make the real deal mac, definitely do it. It’s really not difficult at all. It comes together super quickly! 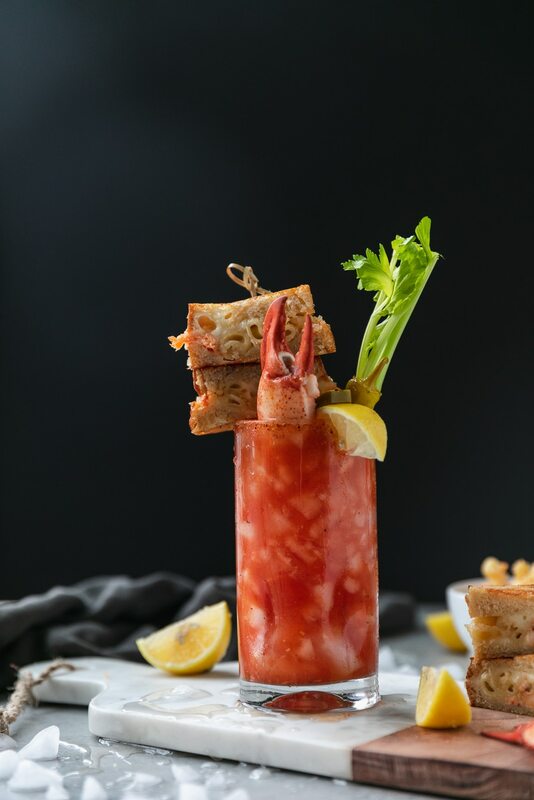 The grilled cheese garnish is super fun, but the actual bloody mary recipe is fantastic too. Being from Maryland, I always love to add a little Old Bay spin on my bloodys. If you’ve never had old bay, It’s a delicious seasoning blend that is typically used on seafood. I can’t really describe the flavor, but it does have paprika, celery salt, and a ton of other seasonings in it. 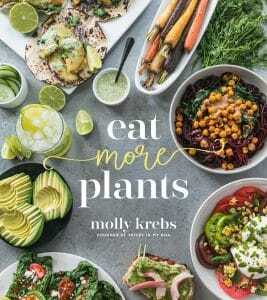 I grew up eating it on steamed shrimp, steamed crabs, and crab dip, and it’s just SO good! 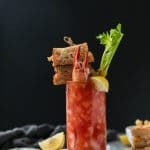 I like to rim these bloody marys in a little bit of the seasoning, and I add some to the actual cocktail itself. 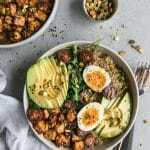 It adds just a touch of spice and I absolutely love it. 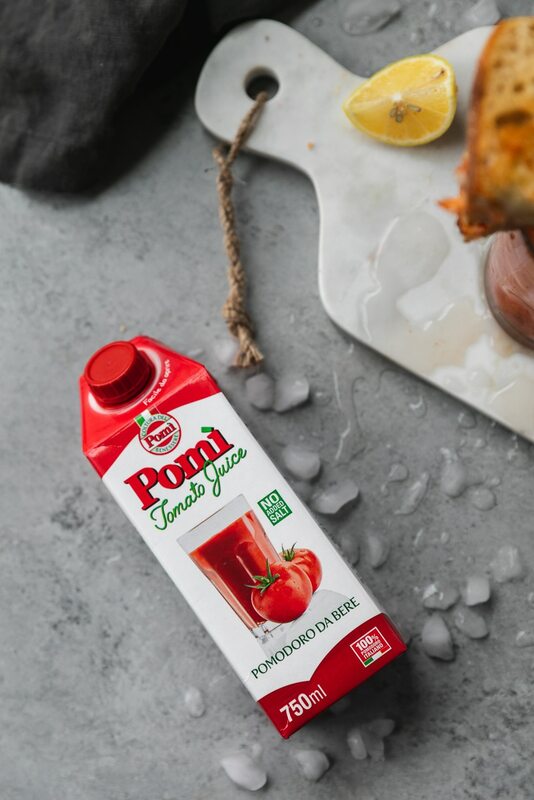 The main component of these bloody marys that makes them so good, is Pomi tomato juice! 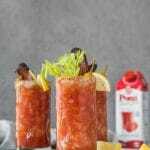 I absolutely love using their juice for my bloody marys, because the quality is unlike any other tomato juice I’ve tried on the market. It’s so rich in tomato flavor, not watered down at all, and to me, you truly can’t beat the quality and flavor that Italian tomatoes offer! I love it! In addition to the tomato juice, I add a little freshly squeezed lemon, Worcestershire, horseradish, hot sauce, celery seed, and Old Bay. 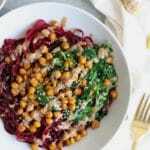 It’s such a simple recipe, but so delicious and the tomato juice really shines! I love to garnish them with a lobster mac grilled cheese, a celery stalk, a lemon wedge, a pepperoncini, and a few pickled jalapeños. But parishes are totally up to you! As long as grilled cheeses are involved, we’re in business. After you have the mac and cheese made, these really come together so quickly. 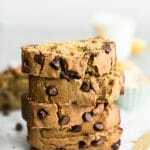 If you’re making these for guests, you can make the mac ahead of time, mix up your bloody mary ingredients, and then just make the grilled cheeses, and pour the bloody mary over ice when guests arrive! You could even make the garnishes self-serve, and create a bloody mary bar out of it! The options are literally endless. The most fun way to celebrate game day! 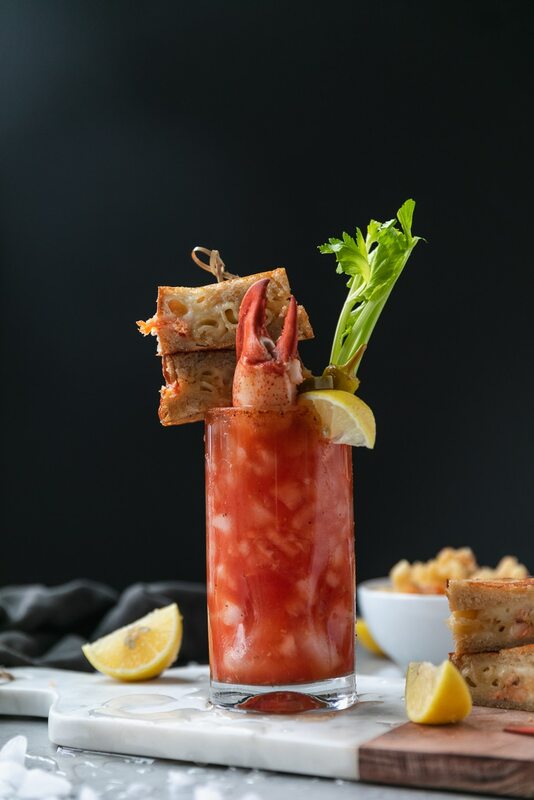 These Old Bay Bloody Marys with Lobster Mac and Cheese Grilled Cheese are such a fun cocktail to serve on game day or for your next brunch! 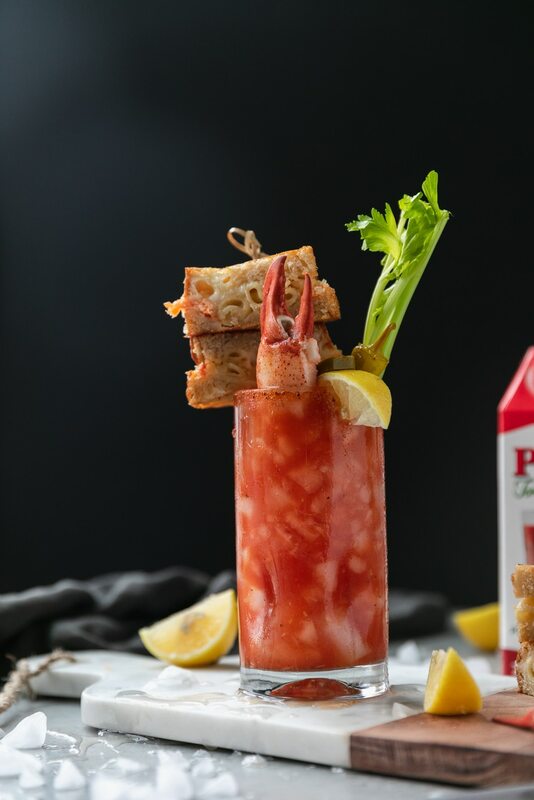 The Bloody Marys are pretty classic, but with a little Old Bay twist! They're garnished with the most decadent grilled cheeses (there's lobster mac and cheese inside of them! ), celery, lemon, and pickled veggies. 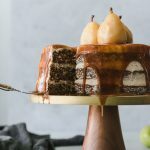 So perfect to serve at a party! 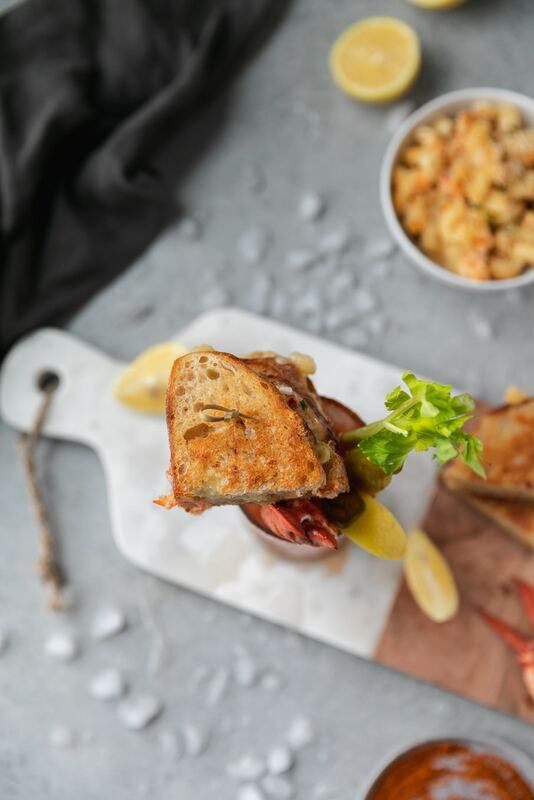 a lobster mac and cheese grilled cheese for garnish! Moisten the edges of your glass with a lemon wedge and rim in old bay. Fill your glass with crushed ice. Add the tomato juice, vodka, lemon juice, Worcestershire, horseradish, old bay, celery seed, and hot sauce. Stir vigorously to combine. Garnish with a celery stalk, a lemon wedge, a pepperoncini, a few pickled jalapeños, and finish with the lobster mac and cheese grilled cheese skewer! Preheat a nonstick skillet over medium-high heat. Butter the outsides of the bread slices, and top both sides of insides of bread with the grated cheddar, half on each side. Top one slice with the mac and cheese, and carefully top with other bread half (basically, you want the cheese on both sides to envelope the mac and cheese!). Place sandwich in skillet (I added a little butter to the pan too), and toast on each side for 3-4 minutes, until cheese is bubbly and bread is golden brown. Remove from pan, let sit for a minute and cut in half. Thread sandwich on a wooden or bamboo skewer for the drink!